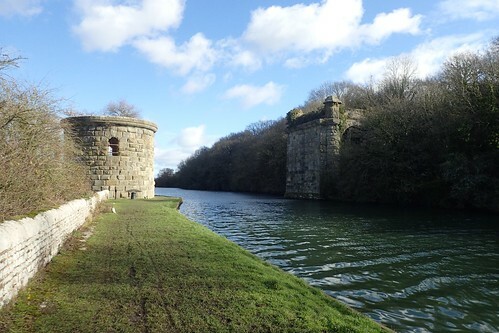 I followed the roads west for a good 1.5km, before I would rejoin the Severn Way at Berkeley Pill. 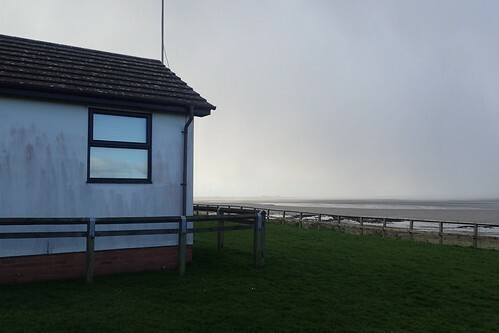 I remember this day for being as cold as a previous walk to Berkeley from Oldbury-on-Severn… Except, this time, there was also the wind to contend with. Freedom. That’s what I felt as I climbed the first stile. Not a single cow ahead of me. 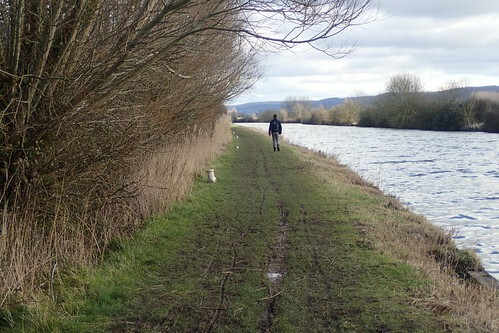 I would have to walk another kilometre before reaching the Severn; still following the bank of the pill, as it widens towards the river. Clearly, the tide does come in high. This was very close to the right of way, on the other side of that fence. 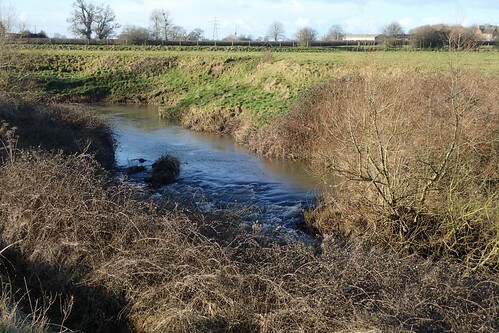 But for the raised bank, the local land would be flooded. 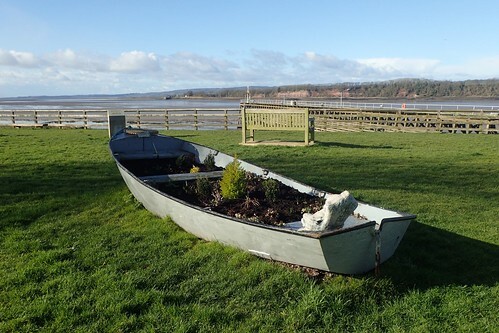 There it was; the River Severn, with Lydney on the far side. 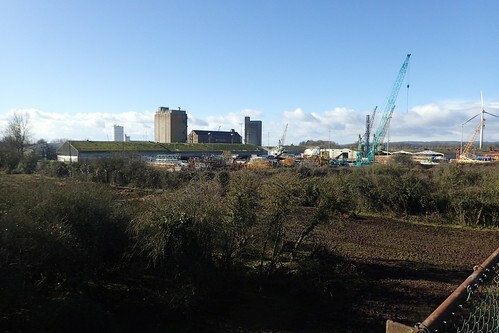 Looking back, I could clearly see Berkeley Power Station, with Oldbury Power Station in the distance – both of which were passed in a previous walk. 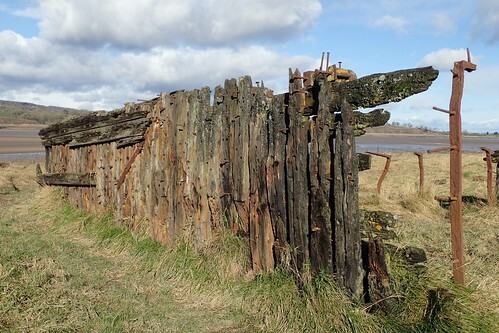 I do wonder how many more I may encounter, following the Severn Way. 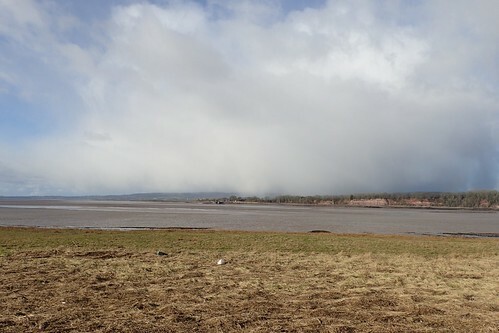 Just south of Lydney, I could see cloud pouring over the Bristol Channel. Today’s forecast had been a dry one. I wasn’t’ expecting anything more than a cold wind to contend with. 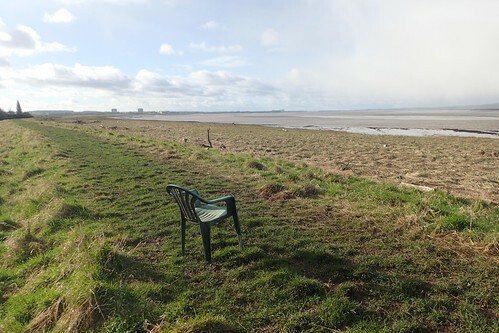 Just ahead of Sharpness, I rescued this plastic chair from what the previous tide had left behind. I thought about using it myself but instead, left it for another walker to appreciate. 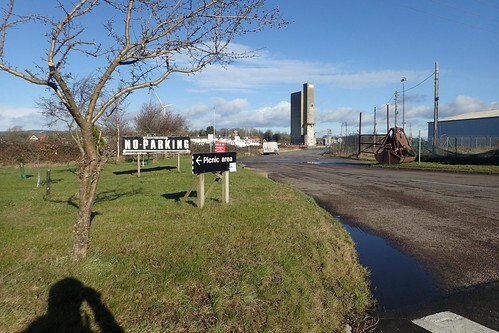 I felt quite intimidated by the signs surrounding Sharpness. 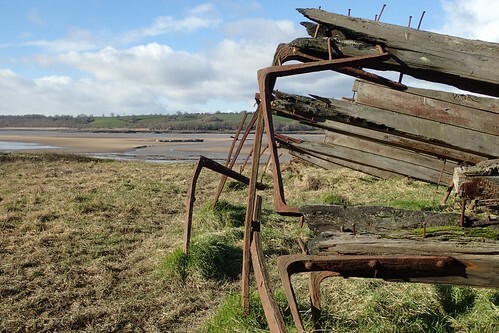 I was walking the Severn Way, for goodness’ sake. 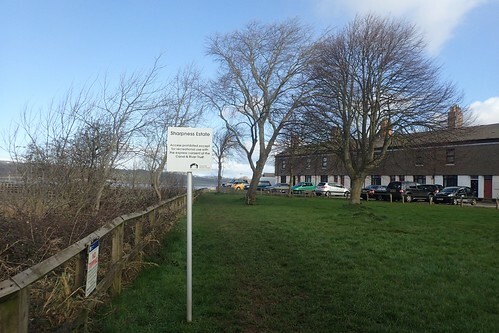 I do wish they’d re-word such signs, to simply indicate that you must not interfere with the private residential land. There’s a picnic site around here on my OS map and it was about time for me to sit down with a cup of tea. Looking south along the river from the picnic site, well, there wasn’t much of a view at all! Although the cloud didn’t pass directly over my head, I met many drops of rain as I began to sit down, thanks to the south-westerly wind. It wouldn’t last for long and didn’t delay my snack stop. 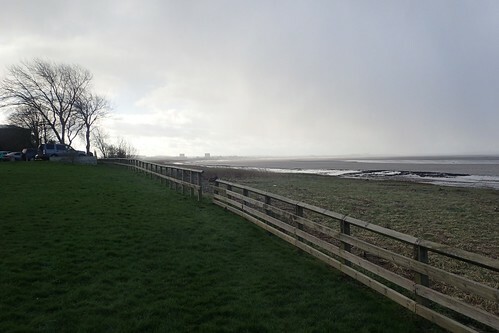 As the cloud began to clear, I could just about see the Severn Bridge with the M48 crossing. 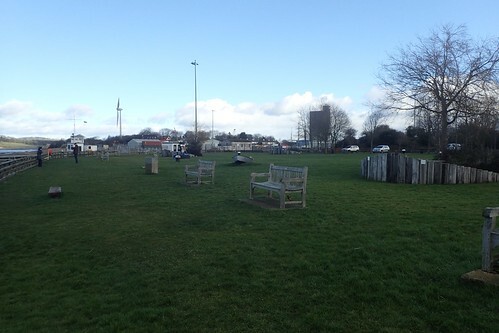 It’s an interesting picnic site in itself, with more benches than you could shake your backside at. 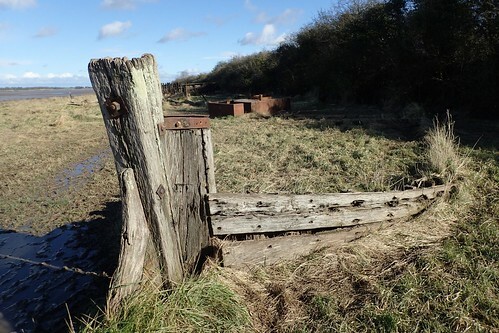 When you look at the mud surrounding this old pier, it’s hard to imagine it was ever used, back in its day. Quite rightly, it’s closed off to prevent public access. But still standing, nonetheless. One day, it may inevitably fall victim to the tide. 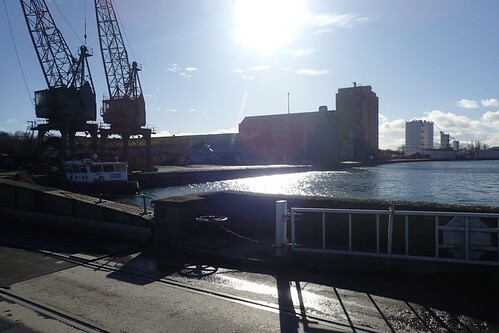 Sharpness is a shipyard and drydock, with repair and maintenance facilities for boats of a limited size. 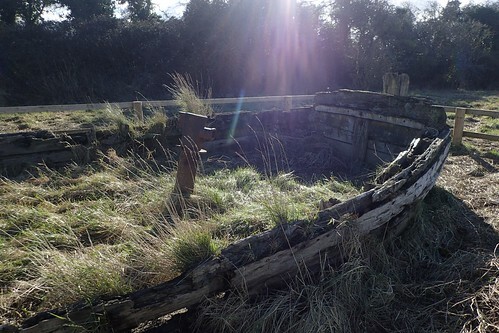 It has otherwise been redundant for around half-a-Century. 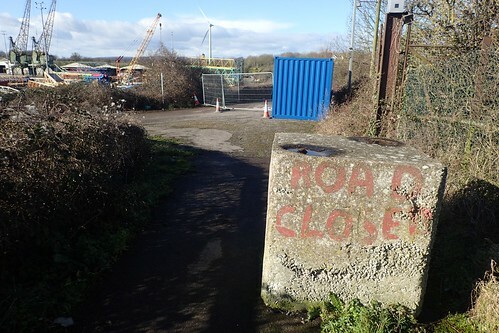 While red signs warn of this being a ‘danger area’, I imagine you could continue to walk through and around it (as the Google StreetView car has clearly done). 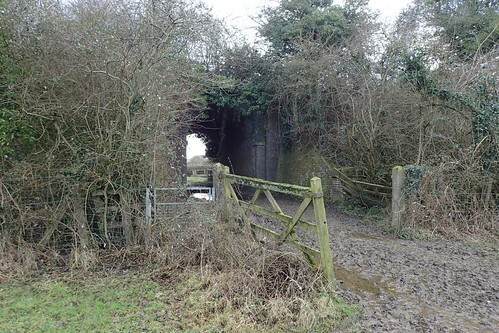 But the Severn Way diverts away from it; crossing a railway line to then follow a minor road to the north-east corner of the yard. 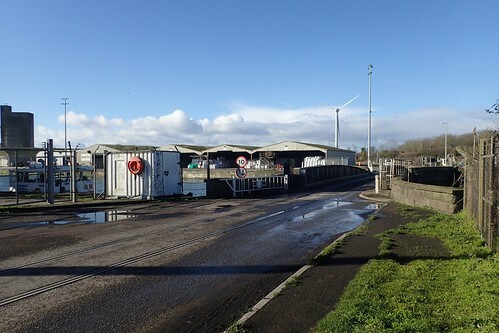 My way forward would cross a swing-bridge, to north of the dry dock. 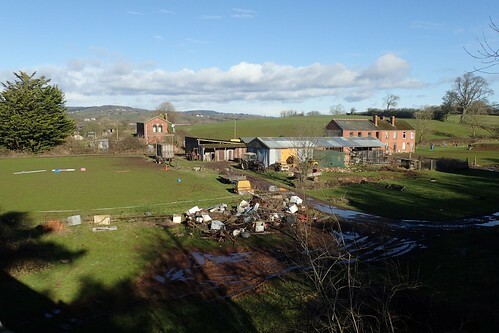 Down to my right, one farmer had made a right mess on their land… Were they going to burn it? I still can not see the thinking behind piling it up like that. 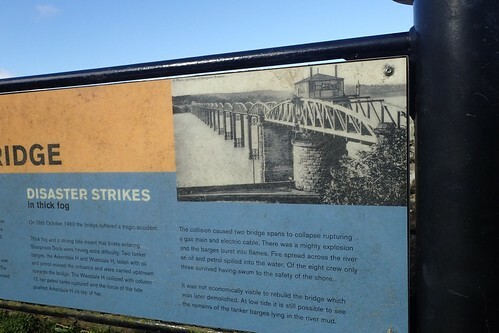 Before I could even reach the swing-bridge, I was faced with a dead-end and no signs for a diversion or waymarking in sight. 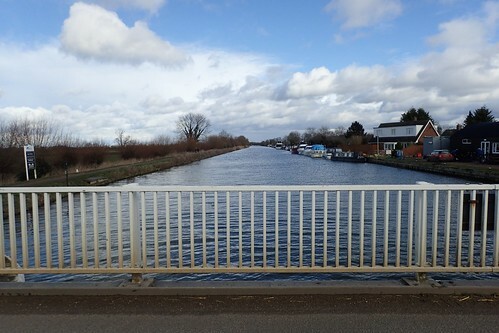 Another bridge crosses the lock just south of this one. I wasn’t sure if public access was allowed but there were no signs warning me to keep away. So, eventually and with pace, I chanced it. Cars drove past without stopping. Signs advised cyclists to dismount. There was no ‘man at the gate’ to tell me to turn around. Really, it was no different to similar crossing the River Avon in Bristol. It was a Sunday and there was no activity to be seen or heard. 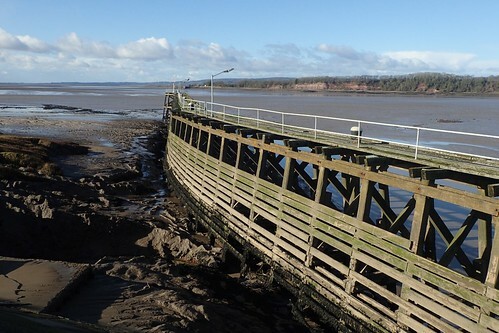 That’s the bridge over which the official Severn Way follows. 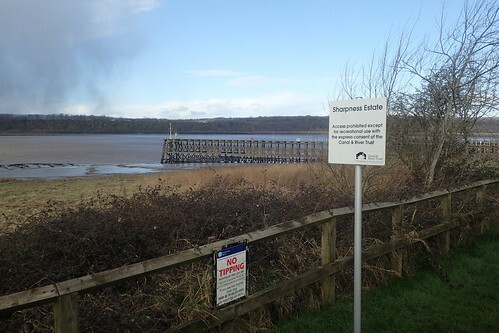 I’m under the impression that it’s been closed for some time… I would’ve like to have seen a diversion put in place, not that I’ve ever met anyone who has or has intended to walk the Severn Way. 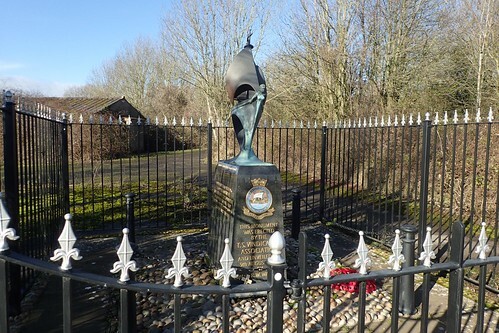 I did find my next signpost at a road junction beyond the bridge, which led me on a path beside the Sharpness Dockers Club and, before that, a memorial. 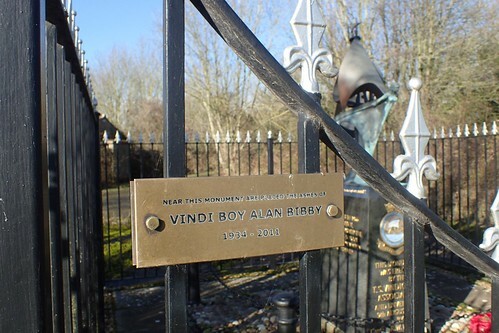 I believe Alan Bibby would’ve been on the Vindicatrix; which was moored at Sharpness and provided as a training ship for the merchant navy up until 1966. I passed through a tiny car park, packed with cars, to drop down to the marina near the north-western point. 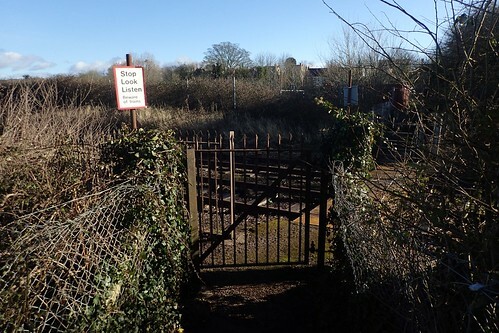 I presume this is the only way to reach it from the south, as a locked gate otherwise prevents potential access from before the Dockers Club. 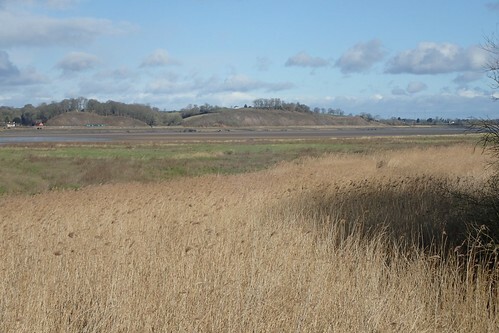 This was where I joined the Gloucester and Sharpness Canal, close to its basin. 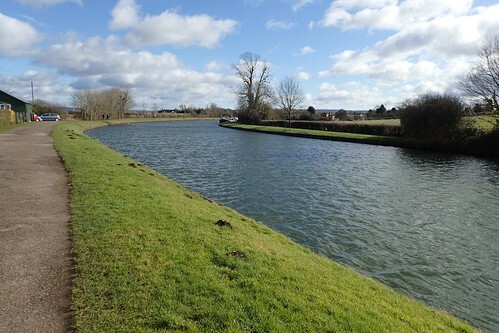 This canal will also feature in my next walk along the Severn Way. 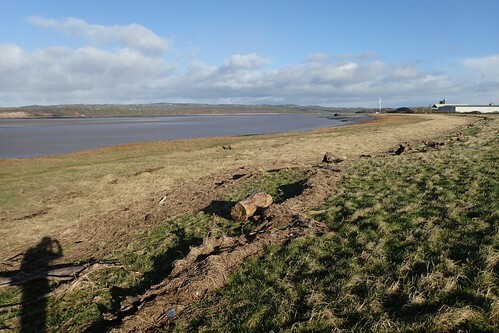 I was losing sight of the Severn, as I walked on towards Purton. 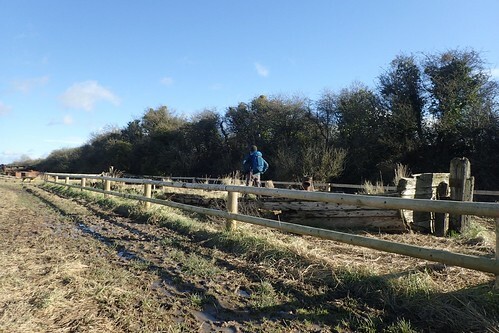 But, there wasn’t an awful lot to admire in all of the mud. 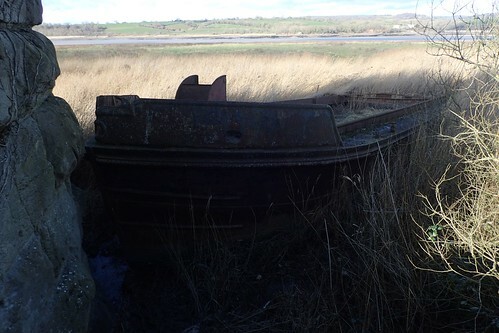 Before I could see it, I heard a train running north across the channel and from Lydney. It looks as though this line runs in to Gloucester. 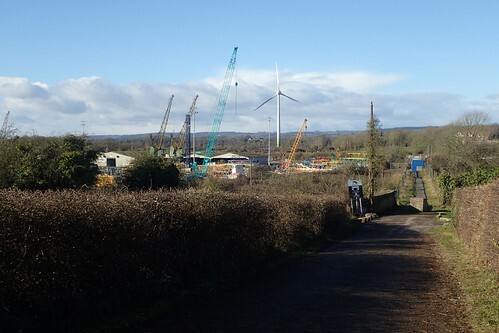 Only half-a-mile along the canal from the marina and I noticed these structures on either side. 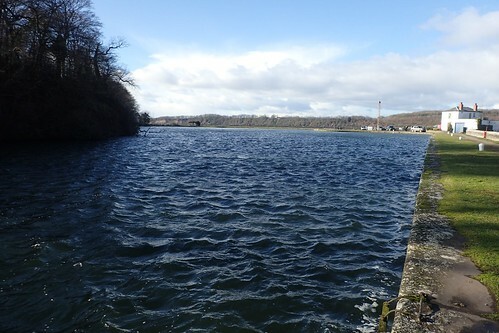 There was once a railway bridge here, which was unfortunately struck by a boat in 1960. 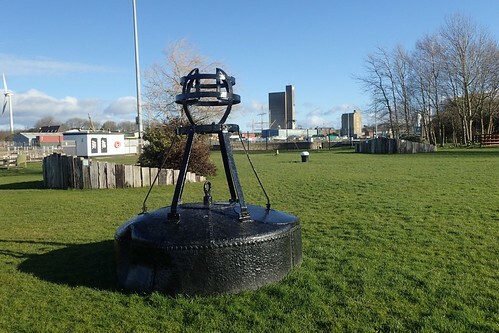 Since then, the structure has been decommissioned. 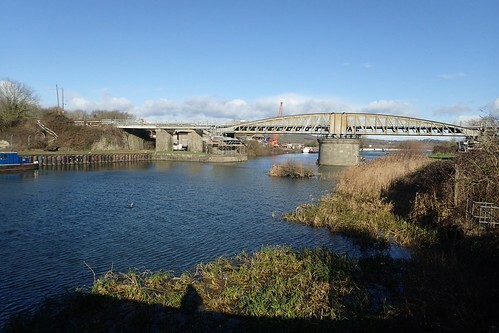 Along with the two road bridges crossing the Severn to the south of this location, we also have train lines running underground. 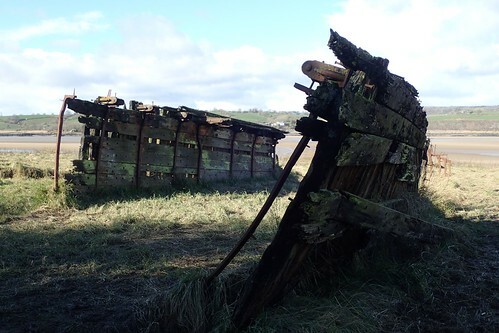 I don’t know if this is one of the barges that struck the supports but it can be seen on the western side of the remaining structures. 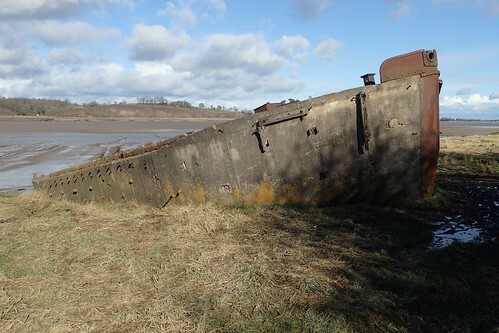 This is Purton Hulks; a resting place for ships that have lost their way along the Severn. 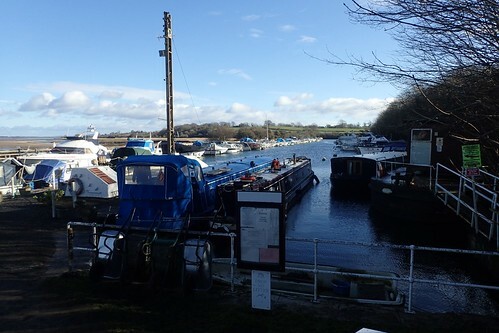 Some of the barges and ships here had been built in the mid-Nineteenth Century! Several were partially embedded within the ground. 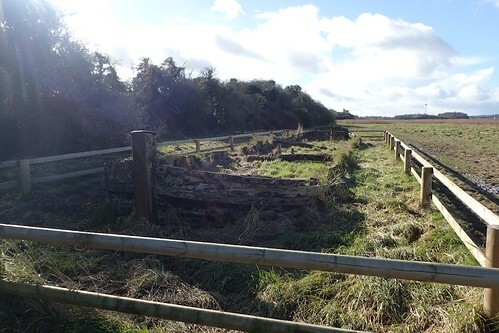 Much of the work to rescue these ruins from the mud was completed in the 1990s, with funding from a local charity organisation. 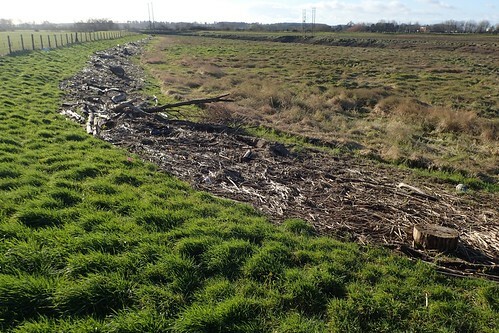 I also read that their presence is also welcomed as an ‘intermediate’ flood defence, ahead of the actual river bank. An incredible area that I was completely unaware of, before this walk. Returning to the Way from my intriguing detour, it was time to push on, keeping the guide to my right in the aim of reaching Slimbridge for lunch. 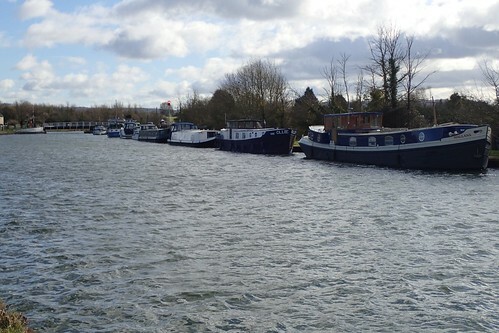 Purton was also a popular location for mooring. You can also choose to ‘Become A Friend’ of the trust, receive benefits for doing so and make monthly payments, if you so wish. If, like me, you’d like to make a one-time donation, this is the link to their website. I probably had about 2.5 miles of the canal path to go. 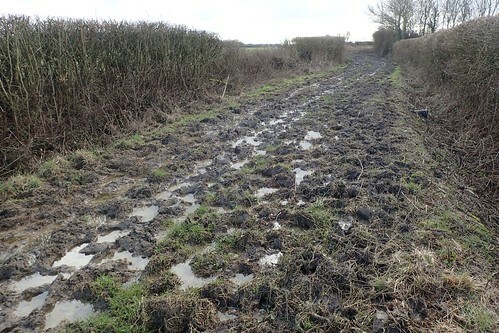 Slippery with mud underfoot, it was a bit of a slog. I overtook a couple of dog walkers and soon lost sight of them. Out of nowhere, the man in the photo above, appeared behind me and started talking! Within moments, he was two-hundred metres ahead of me! Walking a very reasonable pace and possibly wearing jeans! Perhaps our paths will cross again on a future walk. 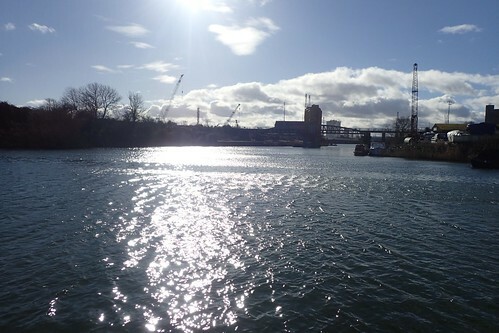 I’d lost sight of him, by the time I reached the road bridge. 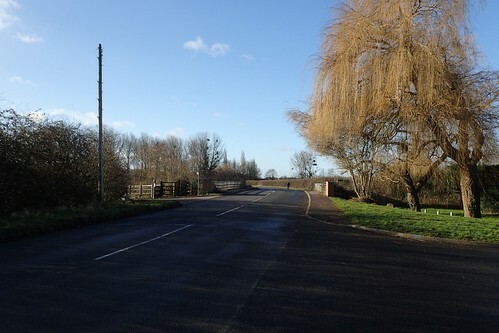 I had previously thought about following this road all the way to the wetlands site at Slimbridge, with its large car park and, presumably, a visitor centre… But, the road looked long and there was no pavement on either side. 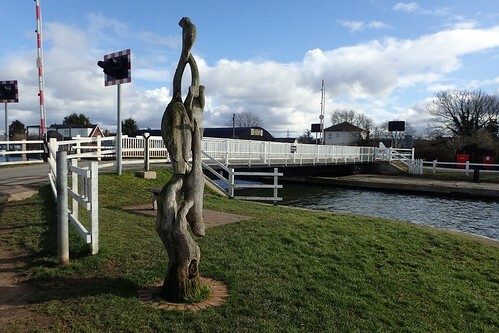 There’s an interesting tree sculpture – possibly carved using a chainsaw – at the canal crossing point. I recognise the hand rising up from the ground, while the rest is a mystery to me. 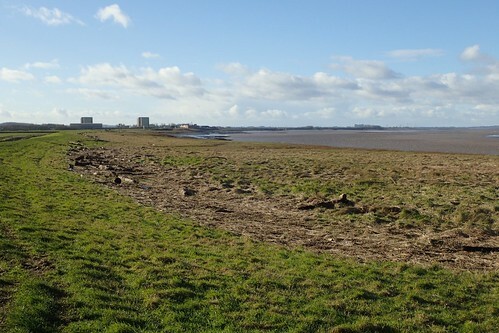 From here, I would turn inland towards Slimbridge village. 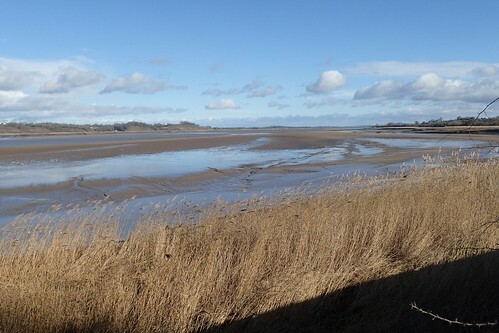 My next walk along the Severn Way will begin in Frampton-on-Severn, just a couple of miles to the north. 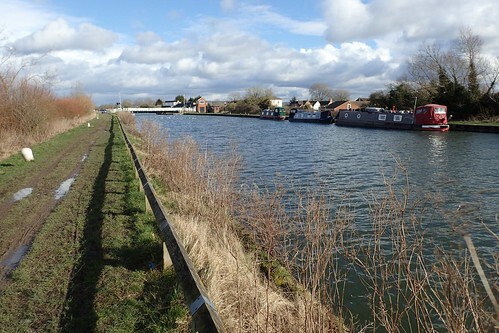 I’ll probably walk down the canal path to this point and back up again, so I can say I’ve done it. 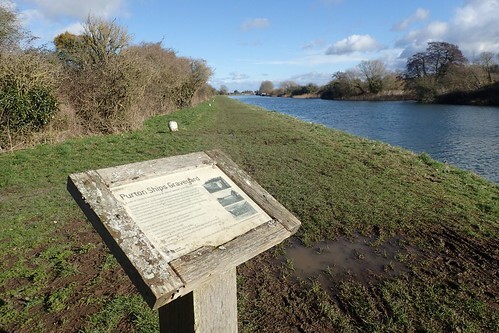 Interestingly, Brunel Walking Group were walking from Frampton to Slimbridge and back on this very day… I didn’t know of the exact route and wondered if I might encounter familiar faces during the lunch hour. But, it wasn’t to be. 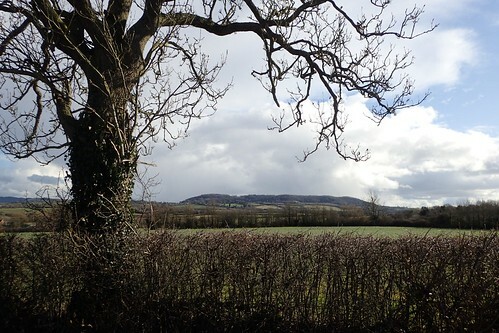 There isn’t an awful lot to share about my return route towards Berkeley, aside from the fact that it was hashed together in a hurry and, for the first two-thirds, would mostly follow country lanes. Hopefully, you get an idea of the conditions I had to endure! At no point didn’t it ease up. Sucking and slapping at my boots; I soon had water leaking in and over my ankles. Oh, how I should’ve stuck to the road. My feet were grateful to return to tarmac, just north-east of Breadstone. There was even a puddle at this point, which I could use to wash away some of the mud I’d collected. Less than 3km from Berkeley, I would leave the roads again to cross open farmland. Again, there were no signs of livestock. While the ground was a bit wet in places, it was nothing like that of which I had just survived. 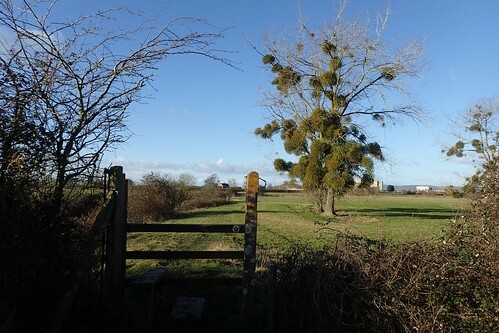 Heading south-west towards Berkeley, I encountered this obstruction at the end of the second field. 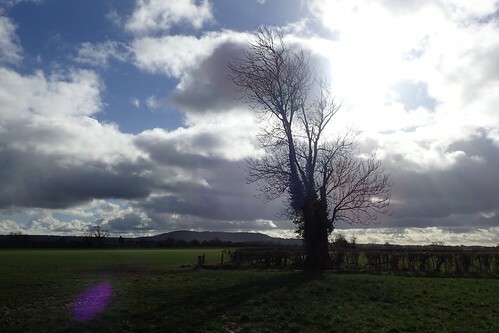 I’ve already reported using using the Ramblers’ Pathwatch app. But, as with the other incidents I’m about to share, I’ve still yet to report them directly to the council, almost one month later. 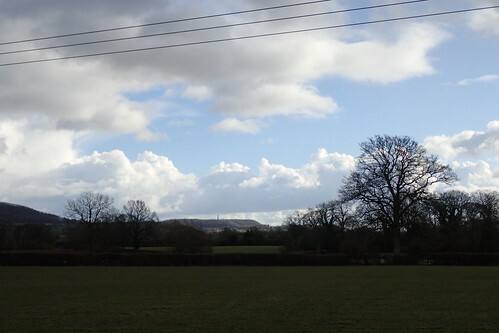 I’d thought about stopping for lunch in one field, with a clear view of the Tyndale Monument. 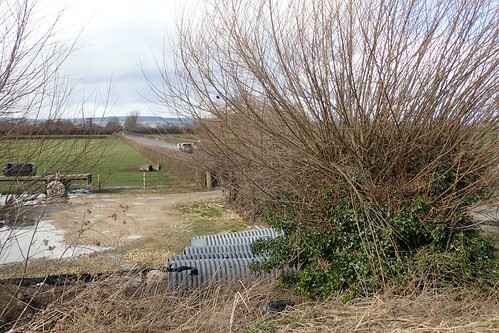 But I could see a potential landowner in a hi-vis jacket, over the next hedgerow. 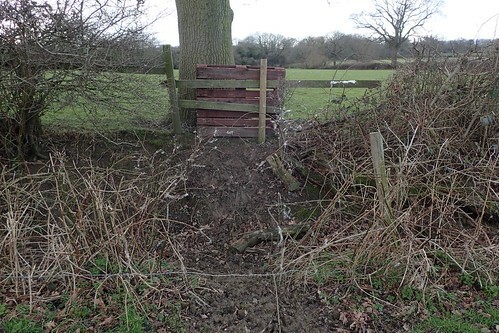 He wasn’t a walker as he was many metres from the right of way… Some farmers object to people resting on their land. 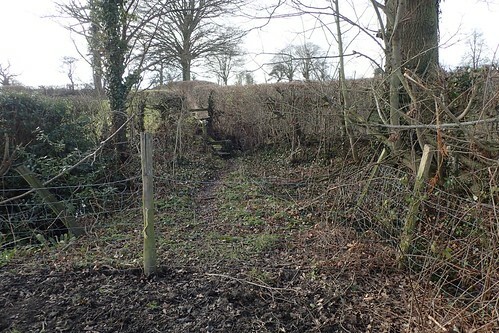 Next up was a defeated footbridge, en route to a stile. It looks as though the earth beside the stream, which had also been supporting one end of the bridge, has given way. Somehow, I made it across safely but not without threat to my ankles. 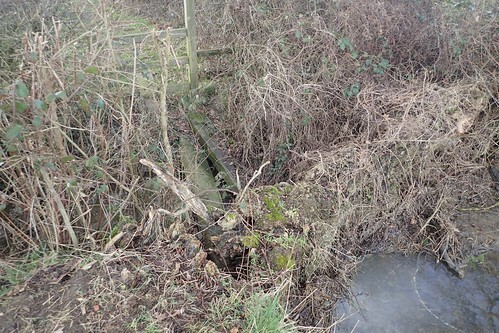 A crossing point between the next two stiles was drowning. This issue isn’t nearly as critical as any of the others, since it may not be the landowner’s fault. This is why I predominantly wear leather boots in the winter. 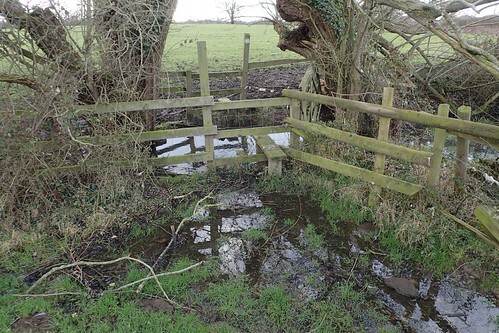 I was eyeing up the next stile when I found a stile obstructing it on the other side. There were no waymarks here although, a gate a few metres away was unlocked – if you look at this point on the map (SO 701 000), you’ll see a black dashed line indicating the gate-route. Still, I’d like to enquire about this, based on the other evidence I’d encountered. Under the railway bridge, right over a footbridge and I would arrive at Ironmongers’ Lane. 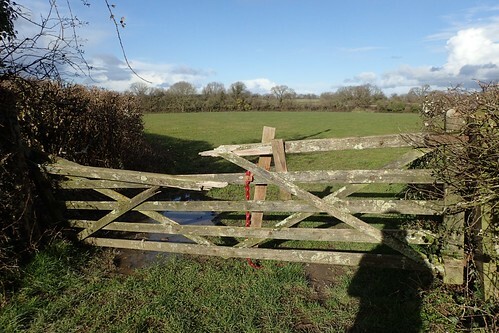 …Via a broken five-bar gate, also devoid of waymarks. 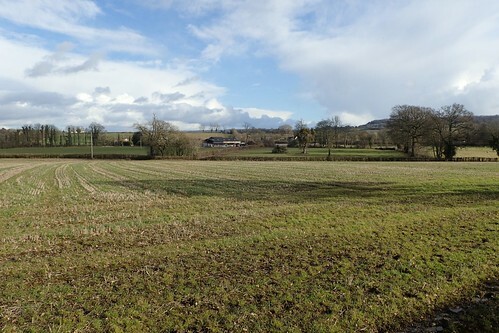 There was a house here, from which I was looking to find and follow a right of way across further fields and on towards Berkeley. I was feeling unusually exhausted, physically and decided to head down to the B-road… With no pavement to follow and infrequently dodging cars. But, it got me to where I wanted to be. 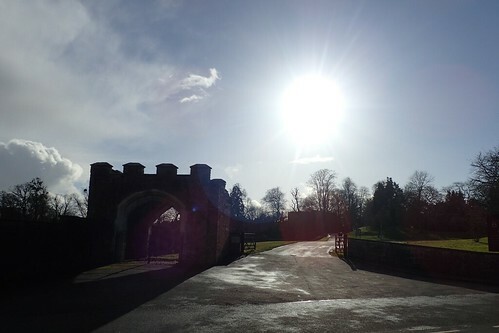 I did pass the driveway entrance to Berkeley Castle. Somewhere I’ll look at visiting another day.